E Series – Gaska Tape Inc.
Gaska Tape’s EG Series are high performance closed-cell, cross linked polyolefin foam tapes, coated on both sides with a highly aggressive acrylic pressure sensitive adhesive, that adheres well to a wide variety of surfaces. These products are available with a blue polyolefin film liner or an 84# polycoated two side, brown kraft liner. This product has been tested according to AAMA 800-05, section 1.6, 810.1-05 Expanded Cellular Glazing Tape, Type 1, and exceeds the specification requirements. 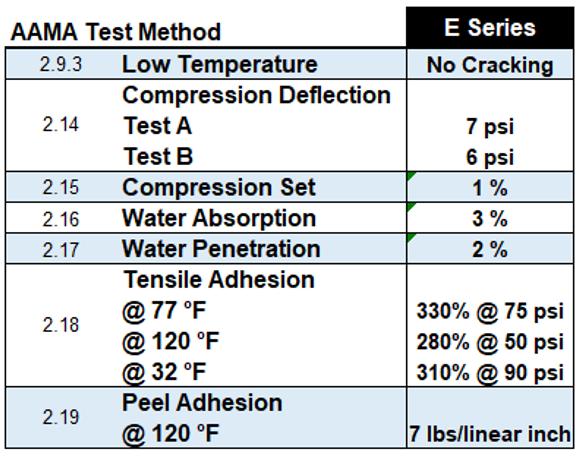 Gaska Tape’s EM Series is a lower cost closed-cell, cross linked polyolefin foam tape. They are coated on both sides with a high energy surface adhesive that adheres well to a wide variety of surfaces for light duty mounting. Gaska Tape’s EI Series is a low cost closed-cell, cross linked polyolefin foam tape, used for general purpose. Polyolefin foam tapes provide excellent sealing, durability and are conformable to irregular surfaces. Closed cell structure provides sealing, cushioning, thermal insulation, deadens sounds, and eliminates excessive vibration. Aggressive adhesive provides excellent initial tack for immediate anchorage to a wide variety of surfaces commonly used in the window assembly industry. EG Products perform well over a broad temperature range and are excellent in all type of glazing applications. EM Products perform well over a broad temperature range and are excellent in all type of mounting applications. EI Products perform well in all type of general purpose applications. NOTES: Typical performance properties and characteristics are based on samples tested and are not guaranteed for all samples of this product.